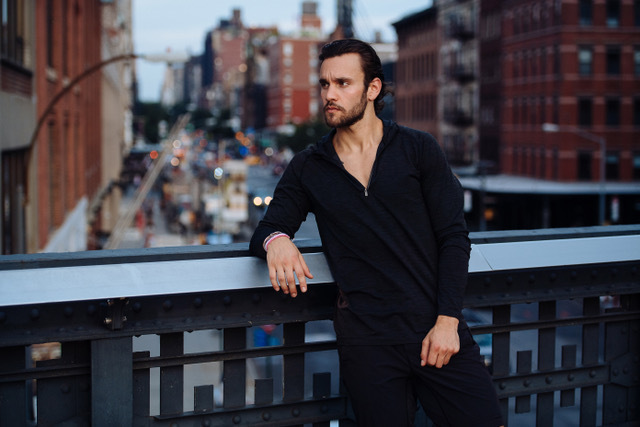 Max Karp and is an instructor at Barry’s Bootcamp in New York City. Athletics has always been an integral piece of his life. Originally from northern New Jersey, Max played DI baseball before finishing his undergraduate studies and then moved to New York City. Health and fitness first started as a hobby, quickly became a lifestyle, and now a career path that Max couldn’t be happier with. Max found resolve through health and fitness, and as a NASM certified personal trainer, he strives to challenge his clients to reach their fullest potential. Aside from health and fitness, Max loves wine and occasionally lets his artistic side out. Max is also a proud dog dad to a mini labradoodle, Dax! Naturally, many of my workouts are taking a Barry’s class – strength and cardio based interval training! I’m a sucker for a great abs class on Thursdays. I also aim to get into the gym and focus on heavier lifts a few times per week. Though, when I can’t make it to the gym or the weather outside calls for it, I lace up the kicks and go for a run – typically logging a 5k or 10k distance. With EBOOST, everything becomes more efficient. I work harder, am energized for longer, and recover way faster – all gearing me up for the next day. And, my results are so much better. As a guy with a huge appetite, I started following an intermittent fasting diet towards the end of college — fasting from the time I go to sleep until dinner the next day (18-20 hours). In recent months, however, this has adjusted to my crazy lifestyle. It’s similar in some ways as I largely restrict calories early in the day before eating anything large. My mornings always include coffee and Kombucha (the best! ), and my meals themselves are little-to-no-carb. The meals themselves are basically paleo – lots of fruits, veggies, and protein. How have you incorporated EBOOST into your daily routine? EBOOST has undoubtedly become a major part of my daily routine. Every morning before I head out to teach – and especially when I’m feeling a bit rundown – I have a Super Powder (pink lemonade, for sure). Before workouts, I’ll throw back some Berry Melon Pow for that extra kick. And for the days that start early and end late, I’m bound to have a Superberry Shot at some point. My favorite product, hands down, is the Super Powder – pink lemonade! Incorporating vitamins, electrolytes, antioxidants, nootropics, and NATURAL caffeine has made a huge difference in getting me through my day. It’s an all-in-one product that I can count on when I need it most, and one I rarely can go without! Find out what Max is up to by following him on Instagram, @maxkarp!